Caves ... sure, the Florida Nature Coast has lots of famous caves that attract people from all over the world. Devil's Den, Manatee Springs, Eagles Nest ... but those are underwater caves that attract daring scuba divers. How about caves you can explore without getting wet? We've got those too, and they're not all in the north Florida panhandle. 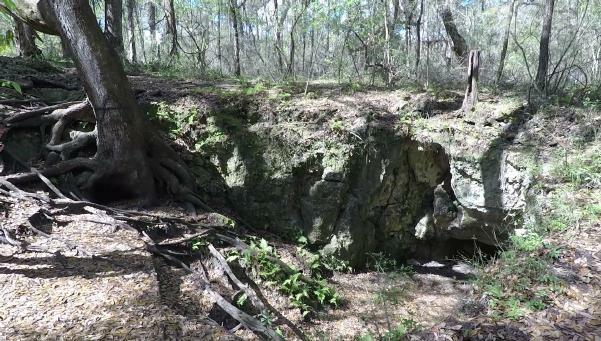 In fact, some of the oldest and most interesting caves are located within the Withlacoochee State Forest. A total of 37 caves have been discovered to date ... most of them in the Citrus Tract. Many of them are closed to the public in order to protect the caves from vandalism, and to protect animal habitats. For example, Bat Cave - located near the Tillis Hill Recreation Area, is protected by a large steel cage over the top of the cave opening. This keeps people out, but allows the large population of bats, who call the cave home, to come and go as they like. Several caves are open to the public - including Dames Cave, Sick Bat Cave, Peace Cave, and Danger Cave. All of these caves are located in the southwestern portion of the Citrus Tract just a short distance from Citrus County highway 491. The video above will take you on a quick tour of these caves. There is a parking area at the trailhead along highway 491. From there, it is a half mile walk to Dames Cave. The ceiling of the main chamber of this cave has collapsed, leaving a gaping hole you can view into. There is a path around to the right where you can go down into the cave and explore other rooms. The walls are covered with grafiti - so this cave has earned the nickname "Vandal Cave". Immediately to the south of Dames Cave is Sick Bat Cave. Farther east, at the point where the trail crosses Citrus Loop trail "D", you will find Danger Cave. And if you follow a trail heading north from Dames Cave, you will discover Peace Cave. Peace Cave probably got its name from the peace symbols painted on a nearby tree. It reportedly has the most extensive network of pathways and chambers of all these caves. All of the caves in this region may be entered. But, with the exception of the first couple of chambers in Dames Cave, they all have narrow, winding, tight passages that require agility - and no sense of claustrophobia. If you plan to explore the caves, come properly equipped with a helmet and light. It is always good practice to explore with a partner, and let someone on the outside know you are in the cave.